One of the things that made the Fantastic Four stand out from other superhero comics was that the characters were, if not media-savvy, at least very aware of the media from early on. This document will highlight some of the Fantastic Four's appearances in the Marvel world of media exploitation. Shortly after the Fantastic Four gained their powers, Reed Richards began to feel guilty for having "destroyed their lives." So he made a very conscious decision to make them all into celebrities, hoping that their fame might make up for their hopes of having normal lives. Shortly after the Fantastic Four broke up, Susan received a telegram from Imperial Studios offering her a new lease on her acting career. (Fantastic Four #191) She starred in Henry's Angels, a generally fictionalized account of King Henry VIII where he was married to all six of his wives simultaneously. Filming was interrupted, however, by the Retrievers of Atlantis. (Fantastic Four #195) It is unclear whether or not the film was completed or if footage of the Retrievers was weaved into the final cut. Although Johnny was "out of town the day the contracts needed to be signed" NBC went ahead with the production a Fantastic Four cartoon using the newly-designed HERBIE the Robot as the fourth member. Reed had designs for the robot already and offered them as an alternative, given that robots -- which are legally treated as property -- would have no need to sign a contract in the first place. 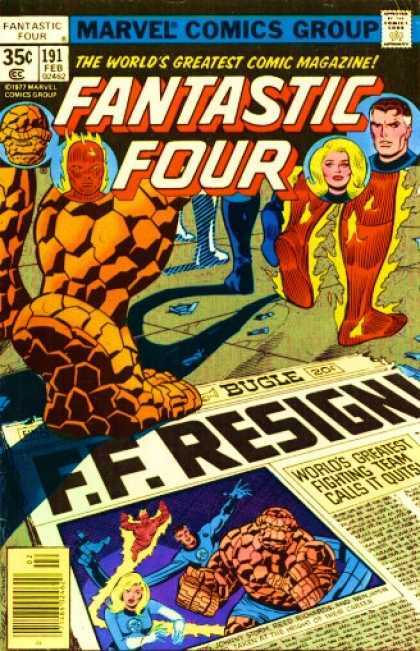 (Fantastic Four #209) The show, however, was unsuccessful as the representations of characters were decidedly flat and only superficially represented the FF. The Fantastic Four, by design, continue to be a market-driven force. T-shirts, bobble-head figures, coffee mugs, snow globes, and comic books featuring their likeness still persist, thanks to the help of a large support staff. (Fantastic Four Vol. 3 #60) Their popularity has led to references by other pop culture icons like Cypress Hill and Linkin Park. While the popularity waxes and wanes with the whims of a fickle public, Reed has gone to extra lengths to make sure that his family maintains a high public profile in some capacity.